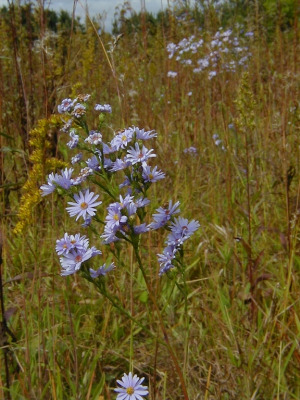 Aster oolentangiensis of Michigan Flora. Savannas of oak (with hickory, sassafras, and/or pine, jack pine in Clare Co.); dry open sandy ground as well as moister prairies. The relatively broad phyllaries and usually strongly scabrous upper surfaces of the leaves will distinguish this species from others with which it might be confused. MICHIGAN FLORA ONLINE. A. A. Reznicek, E. G. Voss, & B. S. Walters. February 2011. University of Michigan. Web. 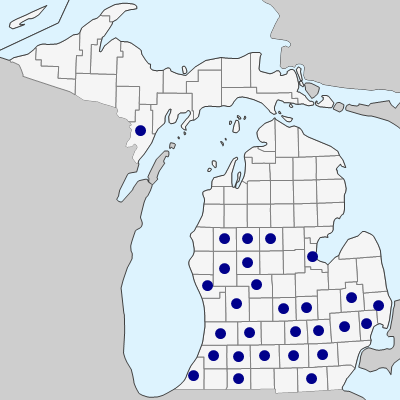 April 18, 2019. https://michiganflora.net/species.aspx?id=489.